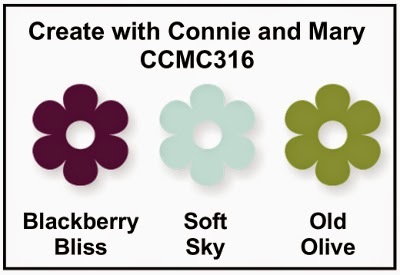 We have a beautiful color combo to use for our challenge this week at Create with Connie and Mary! Blackberry Bliss, Soft Sky and Old Olive are the colors we get to work with and they look great together! I just received this new Oh My Goodies set and thought the birthday image would be a great focal point stamped in Blackberry Bliss, which I did. 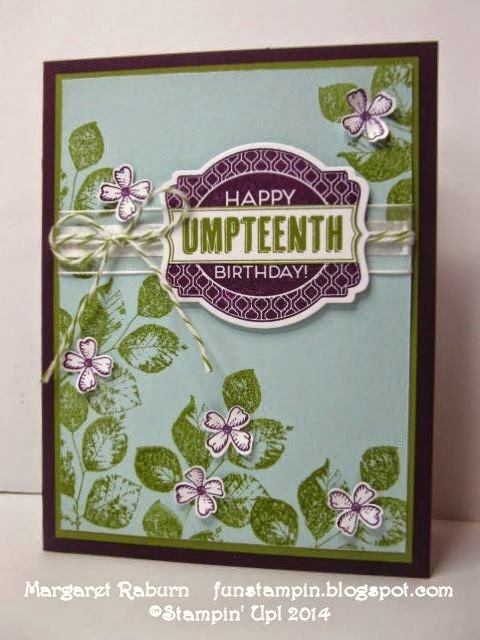 I then stamped it again in Old Olive and cut out the "umpteenth" to layer on top. The card base is Blackberry Bliss layered with Old Olive then the top layer of Soft Sky stamped with the leaves from Kinda Eclectic set. Before attaching to the olive layer, I wrapped a length of White Organza ribbon around then wrapped Old Olive Baker's Twine around twice and tied it in a bow. After adhering the Soft Sky, I attached the sentiment with Dimensionals. The flower stamp from Something to Say was stamped in Blackberry Bliss and attached with Glue Dots. I actually made a another card first and put just a touch of Dazzling Details in the center; when it dried the centers were a bright pink! Even though I liked how they looked, I decided to make another one that stuck with the color scheme, lol! 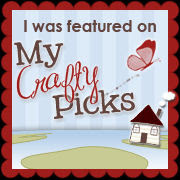 Stamps: Oh My Goodies, Kinda Eclectic, Something to Say. Accessories: Flower punch from Itty Bitty Accents Punch Pack, Deco Framelits, Old Olive Bakers Twine, White Organza Ribbon, Paper Snips, Glue Dots, Dimensionals. This is such a pretty color scheme; how about you making a card using them and linking it up to Create with Connie and Mary? All the guidelines are on their website and it's super easy! We would love to see what YOU do with these colors! 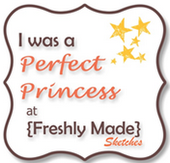 We are always inspired by your creations! Thanks for visiting! 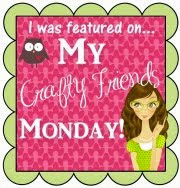 Hope to see you soon on Create with Connie and Mary! Love the Old Olive leaves stamped directly onto the Soft Sky cardstock and the little Blackberry Bliss flowers on top. And that is such a FUN greeting! Great job with the color challenge this week! I love the old fashioned look of your card. The background that you created for the sentiment is gorgeous! 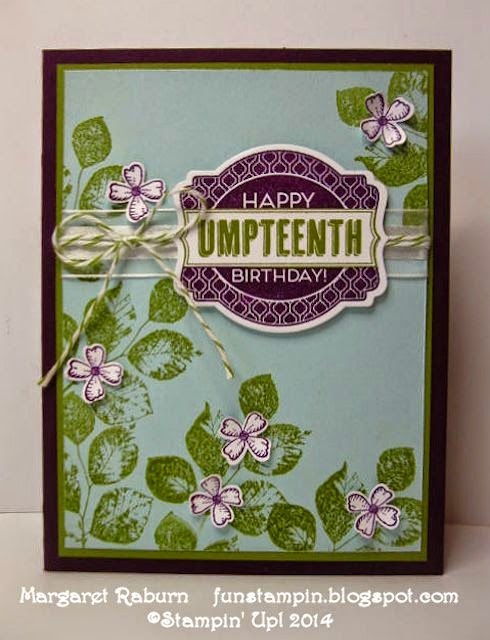 Such a nice card Margaret especially with all of the stamped greenery! Love the way you used the colors with the Old Olive leaves stamped on the Soft Sky. Can't wait to try that. Thanks Margaret. Love how you combined the stamp sets! What a beautiful card!! I love the look of the leaves on the Soft Sky paper...looks so realistic and gives the card the impression of vines coming in off the sides of the card. I see you and I were thinking alike with our stamp sets! Gotta love those leaves from Kinda Eclectic. Beautiful card! I too love the leaves stamped on Soft Sky, so gorgeous!